Thirty artists enjoyed bright sunny skies for all four days of the Castine Arts Association’s 2018 Castine Plein Air Festival. The juried artists arrived on Wednesday, July 18, from as far away as Maryland and Pennsylvania to paint Castine, Maine. A reception was held at the Castine Inn for visiting artists, festival sponsors, hosts, and volunteers. For the next three days the public enjoyed seeing artists painting around the town using oils, acrylics, pastels, and watercolor. Over 150 paintings were produced. The art was displayed and for sale on July 21 during the Artist Reception and Art Sale at the Maine Maritime Academy’s ABS Center for Engineering and Science. The reception featured an Artists Awards Ceremony. The First Place Award was given to Michael Vermette of Indian Island, ME; Second Place Award to Chrissy Nickerson of Canmore, Alberta and Cape Rosier, ME; and Third Place Award to Roberta Goschke of Waldoboro, ME. Five Honorable Mention awards were presented: Elizabeth Ashton Hallett of Brooklyn, NY; Alison Menke of Clarksville, MD; Anthony Watkins of Bradley, ME; Henry Coe of Parkton, MD, and Laurie Lefebvre of Fairfield, ME. Artists Jill Hoy of Jill Hoy Gallery, Stonington, ME, and Josh Adam of Adam Gallery in Castine were judges of the festival. A special “Castine Captured” award was selected by CAA judges Ted Lameyer and Johanna Sweet. The winner was Julia Durgee of Portland, ME. The CAA was pleased to see a large crowd enjoying and purchasing art. The festival is the annual fundraiser for the CAA, which promotes the arts locally in Castine with programs that include literary, visual, musical, and performing arts. Festival director Don Tenney extends a heartfelt thank-you to all sponsors, hosts, and volunteers. 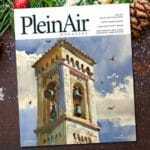 For more information about the artists and the festival, please visit www.castinearts.org/plein-air-festival/. Next articleCan You Paint a Landscape with Just 3 Colors?